Families looking for a free way to jump-start their holiday fitness plans can turn to HCISD Saturday morning for the first Holiday Hustle event. 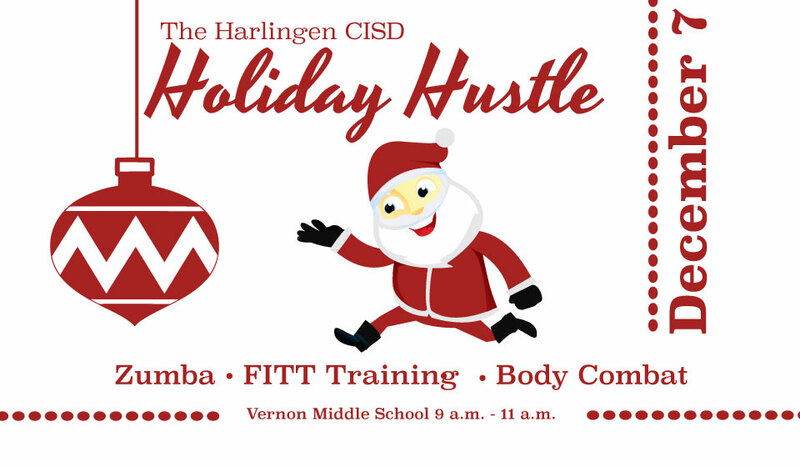 The Fit 4 Life committee is hosting the Holiday Hustle fitness event, which includes free fitness class including Zumba, FITT, and Body Combat, Saturday 9 a.m. – 11 a.m. at the Vernon Middle School, 125 S. 13th St., gym. The event was originally scheduled at Boggus Stadium; however, the location was changed as a result of cold weather. “We’re excited to bring our HCISD family together for this great event to enjoy each other’s company and to support healthy lifestyle choices,” said Luis Solorio, HCISD’s wellness coordinator. Although the sessions are free, the Fit 4 Life committee is asking for toy donations for the Harlingen High School and Harlingen High School South National Honor Society clubs for their annual Operation Santa toy drives, which benefit students in HCISD.